Chemabrasion Patient of Terry J. Perkins, M.D. Unwanted pigmentation, wrinkles, fine lines, textural irregularities, and acne scarring can be very distracting on your face. 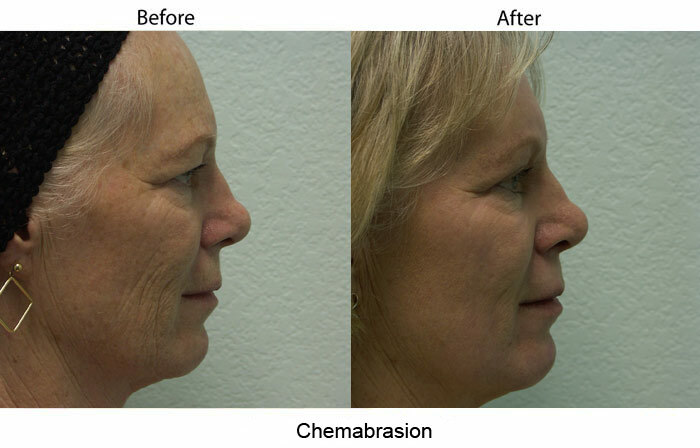 While many medical spa procedures (such as Sublative Rejuvenation, chemical peels, FotoFacials, and laser facials that are available at Evolutions Medical Spa in Santa Barbara) can bring you closer to smoother skin texture and more even skin tone, there is a more aggressive option that can dramatically improve the skin: Chemabrasion. Chemabrasion combines a medium depth chemical peel with a light to moderate depth dermabrasion (important to note that it is not microdermabrasion). Dermabrasion is a controlled injury to the skin that removes the top to deeper layers of the skin. Chemabrasion is ideal for those who want to treat facial wrinkles, acne pits, skin irregularities, photo damage, facial scars, pre-cancerous legions, and early skin cancers. Most people will find a 70% to 80% decrease in wrinkles and a 50% or greater improvement to acne scars. Chemabrasion is often done on the entire face, although the area around the eyes (crow’s feet), mouth (smoker’s lines), or cheeks can be performed as independent procedures. The Chemabrasion procedure is done at Cosmetic Surgery Center by Dr. Perkins in his fully-accredited surgical suite. General anesthesia is not required. Local anesthesia in addition to oral sedation alone (or in combination with intravenous sedation) is sufficient for comfort, relaxation, and unawareness. The down time is approximately 7 to 10 days and work can be resumed after that depending upon how strenuous your job is. The skin will initially be pink but the pinkness will gradually lessen in 1 to 2 months. Mineral makeup, such as Colorescience and a physical sun block may be started 8 to 10 days after the procedure. See more Chemabrasion before and after pictures on the Cosmetic Surgery Center website. For a cosmetic surgery consultation with Dr. Perkins, please contact his office at 805-563-0000.